Wildkin Backpacks, Luggables, AWST Horse Backpacks! Sidekick Backpack: Sidekick Backpacks makes school more fun. The durable exterior can stand up to just about anything – even homework. And the roomy interior helps keep school work organized. 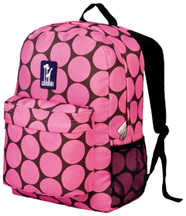 Extra-durable 600-denier polyester fabric with padded back for extra comfort and adjustable padded straps. Interior utility pockets and pencil holder with moisture-resistant nylon lining. Measures 15 H X 12 W X 7 D inches. 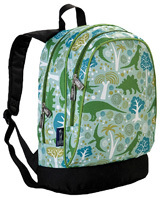 • Sidekick Backpack Dino-Mite: The creative dinosaur pattern is DINO-mite! Stegosaurus, Pterodactyl, T-Rex, Triceratops, Brachiosaurus and Hadrosaurs are all here, so be careful. Set on a background of extinct plants and trees. Ages 3 - 8. Great gift idea! BUY NOW! 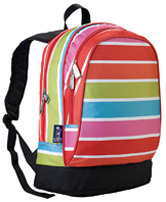 • Sidekick Backpack Bright Stripes: Five thick bands of super-bright colors run horizontally over a white background to make these eye-catching stripes really pop! Ages 3 - 8. Great gift idea! BUY NOW! 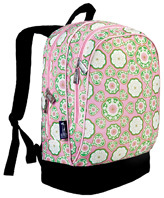 • Sidekick Backpack Spring Bloom: Experience excitement when you see that everything is blooming on this beautiful pattern. Featuring several different paisley and flower patterns. Ages 3 - 8. Great gift idea! BUY NOW! 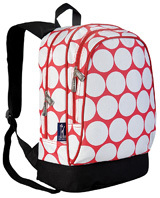 • Sidekick Backpack Big Dot Red & White: The super-popular design that propelled the ever-evolving Big Dot series, the Big Dot Red & White pattern features modishly -symmetrical, large white dots atop a bright red background. Ages 3 - 8. Great gift idea! BUY NOW! 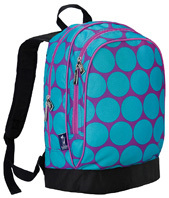 • Sidekick Backpack Big Dot Aqua: The Big Dots Aqua pattern displays stylishly-symmetrical, electrifying aqua dots on a background of rich purple. Ages 3 - 8. Great gift idea! BUY NOW! • Sidekick Backpack Wishbone: Discover your fortunate quality with the Wishbone pattern! 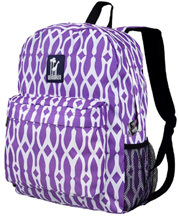 An energetic, stylish design featuring an overlapping wishbone prints in elegant white and brilliant lavender. Ages 3 - 8. Great gift idea! BUY NOW! 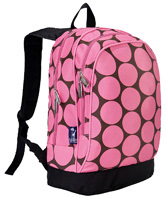 • Sidekick Backpack Big Dot Pink: The Big Dots Pink pattern features elegantly-symmetrical, large pink dots atop a rich mocha background. A bestselling Ashley Collection design. Ages 3 - 8. Great gift idea! BUY NOW! • Sidekick Backpack Majestic: Packed with the spirit of a high-end boutique. With its distinctive color blends and creative geometry, the Majestic pattern generates billowing layers of movement that burst up from the design's smooth pink backdrop. Ages 3 - 8. Great gift idea! BUY NOW! 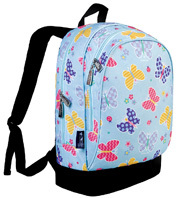 • Sidekick Backpack Butterfly Garden: Colors so delightful you can almost taste them. Designed by the creative minds at Olive Kids, the Butterfly Garden pattern features bright bursts of cuter-than-life butterflies, lady bugs, and flowers on a soft blue background. Ages 3 - 8. Great gift idea! BUY NOW! • Sidekick Backpack Robots: Robot Invasion! These wacky, zany robots invade hearts and inspire smiles! 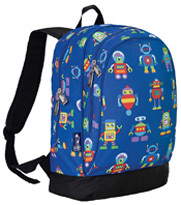 Designed by the robo-geniuses at Olive Kids, the Robots pattern features six colorful, friendly robots on a darkish blue background. Ages 3 - 8. Great gift idea! BUY NOW! • Sidekick Backpack Heroes: A fiesta of heroic lights! This lively pattern pays honor to our brave fire, police, and rescue men and women. 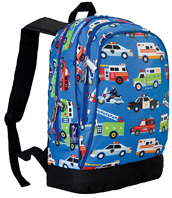 An Olive Kids design, the Heroes pattern features absolutely exceptional versions of fire, police, and emergency vehicles on a rich blue back. Ages 3 - 8. Great gift idea! BUY NOW! • Sidekick Backpack Under Construction: Constructed out of delightfulness! Built by our friends at Olive Kids Designs, the Under Construction Pattern re-imagines the worksite in the radiantly bright colors and fluid shapes of childhood. Ages 3 - 8. Great gift idea! BUY NOW! • Sidekick Backpack Trains, Planes & Trucks: The wildest, cutest, traffic jam ever! 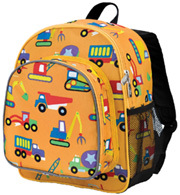 A best-selling design by Olive Kids, the Trains, Planes, & Trucks pattern makes creative use of bold primary colors. The design's assorted group of vehicles stands out wonderfully from the cool blue background. Ages 3 - 8. Great gift idea! BUY NOW! 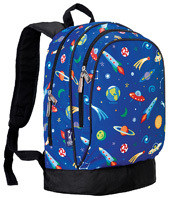 • Sidekick Backpack Out of this World:The Out of This World pattern's sky is a incredibly busy little universe. Created by Olive Kids, this pattern spiritedly blends reality and fantasy with its stylized versions of stars, moons, and alien technology. Ages 3 - 8. Great gift idea! BUY NOW! 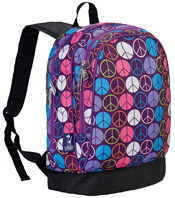 • Sidekick Backpack Peace Signs Purple: Give peace a chance. Our timeless, colorful Peace Signs are set on a purple background. Ages 3 - 8. Great gift idea! BUY NOW! 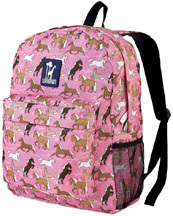 • Sidekick Backpack Horses in Pink: Horses in Pink features a team of fancifully wild horses that prance, dance, jump, and just chill; their bright white manes and tails absolutely shine atop the pattern's exquisite, timeless pink backdrop. A bestselling Wildkin Classic. Ages 3 - 8. Great gift idea! BUY NOW! 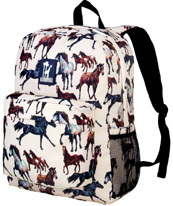 • Sidekick Backpack Horse Dreams: The Horse Dreams pattern showcases a range of horse breeds that are portrayed in stunning detail and accuracy. The horses' various movements are elegantly illustrated atop a smooth, light taupe background. Ages 3 - 8. Great gift idea! BUY NOW! • Sidekick Backpack Water Color Ponies Pink: In this artistic horse pattern, the watercolor ponies are galloping, prancing and walking among paisleys and flowers. Ages 3 - 8. Great gift idea! BUY NOW! 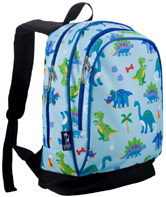 • Sidekick Backpack Dinosaur Land: Dinosaurs have arrived! Olive Kids Dinosaur Land will make kids rumble with per-historic enjoyment. Dinosaurs, including a Brontosaurus and T-Rex inhabit a world filled with volcanoes, primitive trees and dino footprints! Greens and blues are complimented with splashes of bright color for even more excitement. Ages 3 - 8. Great gift idea! BUY NOW! 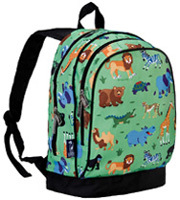 • Sidekick Backpack Wild Animals: The Wild Animals design by Olive Kids is like an assorted family reunion of animals from all across the globe. Penguins, Lions, Camels, Crocodiles, Hippos, Grizzlies and more have put aside their differences to hang out and say hi! Ages 3 - 8. Great gift idea! BUY NOW! 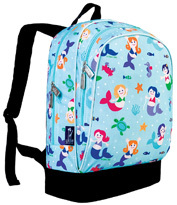 • Sidekick Backpack Mermaids: Designed by Olive Kids, the Mermaids pattern provides an charming group of mer-girls and their fishy friends. Hot pink, yellow, and orange accents pop out from the pattern's cheerful, two-toned, under-the-sea background. Ages 3 - 8. Great gift idea! BUY NOW! 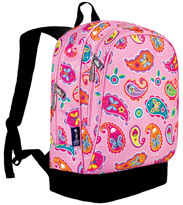 • Sidekick Backpack Paisley: Butterflies flap and bees and ladybugs fly about the pink Paisley pattern. Designed by Olive Kids, this colorful, playful pattern will surely delight. Ages 3 - 8. Great gift idea! BUY NOW! 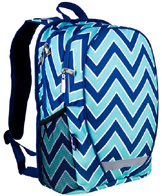 • Sidekick Backpack Zig Zag: Add vigor to your style with the ZigZag print! Two thick colorful bands plus a thin white one zig and zag to create a truly contemporary impression on the classic chevron print! Ages 3 - 8. Great gift idea! BUY NOW! 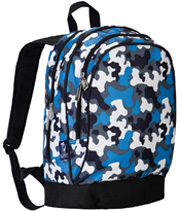 • Sidekick Backpack Blue Camo: The Blue Camo pattern is an updated style of the tried-and-true Green Camo. Colored simply and boldly in blue, black, gray, and white, this Camo pattern is more prominent than it blends in. Ages 3 - 8. Great gift idea! BUY NOW! 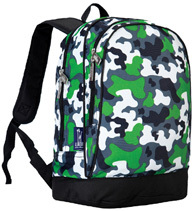 • Sidekick Backpack Green Camo: This Camo pattern is a stylish re-imagination of tried-and-true Camo. Colored simply and boldly in green, black, gray, and white, our Camo pattern is more distinct than it blends in. Ages 3 - 8. Great gift idea! BUY NOW! 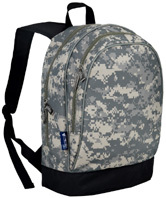 • Sidekick Backpack Digital Camo: This memorable Army Camo pattern is definite to blend in and at the same time, stand out! Ages 3 - 8. Great gift idea! BUY NOW! Macropak Backpack: Hugely-popular Macropack Backpack is a durable and roomy bag that features three generously-sized zipper compartments, multiple inner pockets, and mesh enclosureside water bottle pockets.Side pockets for water bottles. Measures 17 H x 12½ W x 7½ D inches. 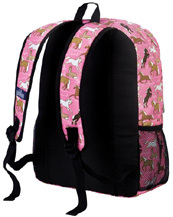 • Macropak Backpack Horses in Pink: Horses in Pink features a group of whimsically wild horses that prance, dance, jump, and just chill; their brilliant white manes and tails absolutely shine atop the pattern's lovely, timeless pink backdrop. A bestselling Wildkin Classic. Approximate ages 8+. Great gift idea! BUY NOW! 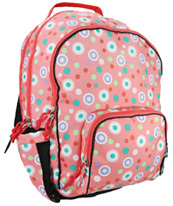 • Macropak Backpack Polka Dots: Approximate ages 8+. Great gift idea! BUY NOW! 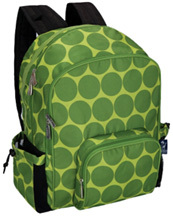 • Macropak Backpack Big Dots Green: Approximate ages 8+. Great gift idea! BUY NOW! 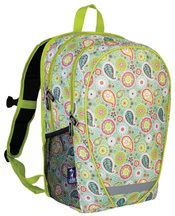 • Macropak Backpack Kaleidoscope: Approximate ages 8+. Great gift idea! BUY NOW! 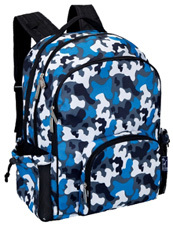 • Macropak Backpack Blue Camo: Approximate ages 8+. Great gift idea! BUY NOW! Crackerjack Backpack: Snap to your day with the Wildkin Crackerjack Backpack. The Crackerjack is perfect for carrying and organizing books, binders, and supplies, or for an overnight adventure. Interior utility pockets and pencil holder with moisture-resistant nylon lining. Adjustable padded straps. Larger than our Sidekick, yet smaller than our Macropak. Measures 16 H X 12 W X 5 D inches. 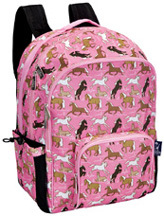 • Crackerjack Backpack Horses in Pink: Horses in Pink features a group of whimsically wild horses that prance, dance, jump, and just chill; their brilliant white manes and tails absolutely shine atop the pattern's lovely, timeless pink backdrop. A bestselling Wildkin Classic. Sized for ages 3+. Great gift idea! BUY NOW! • Crackerjack Backpack Horse Dreams: Horse Dreams pattern features a range of horse breeds that are rendered in stunning detail and accuracy. The horses' various movements are gracefully depicted atop a smooth, light taupe background. Sized for ages 3+. Great gift idea! BUY NOW! • Crackerjack Backpack Water Color Ponies Pink: In this artistic horse pattern, the watercolor ponies are galloping, prancing and walking among paisleys and flowers. Ages 3 - 8. Great gift idea! BUY NOW! 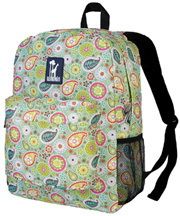 • Crackerjack Backpack Spring Bloom: Experience happiness when you see that everything is blooming on this fine-looking pattern. Displaying several different paisley and flower patterns. Sized for ages 3+. Great gift idea! BUY NOW! 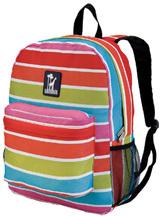 • Crackerjack Backpack Bright Stripes: Five thick bands of super-bright colors run horizontally over a white background to make these spectacular stripes really jump! Sized for ages 3+. Great gift idea! BUY NOW! 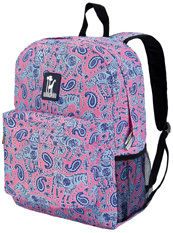 • Crackerjack Backpack Wishbone: Discover your fortunate break with the Wishbone pattern! A crisp, refined design showcasing an overlapping wishbone prints in classic white and brilliant lavender. Sized for ages 3+. Great gift idea! BUY NOW! 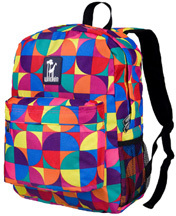 • Crackerjack Backpack Pinwheel: The Pinwheel backpack has a cheerful pattern. In bright colors and geometric shapes, this print will be sure to reel you away to a carnival of color! Sized for ages 3+. Great gift idea! BUY NOW! 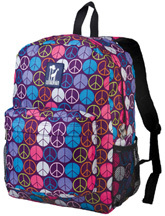 • Crackerjack Backpack Peace Signs Purple: The timeless, colorful Peace Signs are set on a purple background. Sized for ages 3+. Great gift idea! BUY NOW! 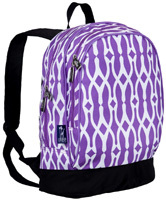 Crackerjack Backpack: Snap to your day with the Wildkin Crackerjack Backpack. The Crackerjack is perfect for carrying and organizing books, binders, and supplies, or for an overnight adventure. Interior utility pockets and pencil holder with moisture-resistant nylon lining. Adjustable padded straps. Larger than our Sidekick, yet smaller than our Macropak. Measures 16 x 12 x 5 inches. 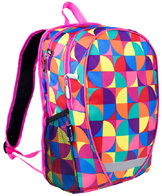 • Crackerjack Backpack Big Dots Pink: Big Dots Hot Pink design features elegantly symmetrical, electrifying magenta dots on a dark yellow background. Sized for ages 3+. Great gift idea! BUY NOW! 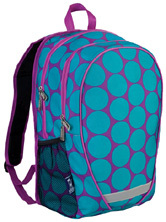 • Crackerjack Backpack Big Dots Aqua: Big Dots Aqua pattern showcases trendy symmetrical, captivating aqua dots on a background of gorgeous purple. Sized for ages 3+. Great gift idea! BUY NOW! 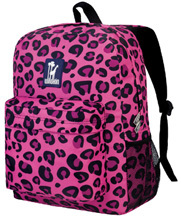 • Crackerjack Backpack Pink Leopard: The Pink Leopard pattern is hot - hot pink! We do not know how our pink leopard would fair in the jungle, but on our bags it is prominent and eye-catching. Sized for ages 3+. Great gift idea! BUY NOW! 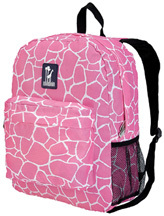 • Crackerjack Backpack Pink Giraffe: Cloak yourself in the spots of our Pink Giraffe! Pink spots on a white background. Sized for ages 3+. Great gift idea! BUY NOW! 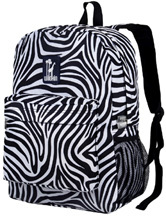 • Crackerjack Backpack Zebra: This Zebra print may be a camouflage in the wild but will be prominent in a crowd! The distinct animal print is a spin of black with white stripes or is it white with black stripes? Both ways, you will love it! Sized for ages 3+. Great gift idea! BUY NOW! 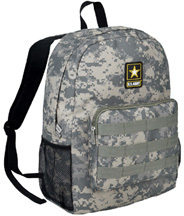 • Crackerjack Backpack U.S. Army: This is an officially licensed U.S. Army Backpack, and made with the same digital camo worn by the U.S. Army! One thinking of the U.S. Army, we can say - Loyalty. Duty. Respect. Selfless Service. Honor. Integrity. Personal Courage. Sized for ages 3+. Great gift idea! BUY NOW! 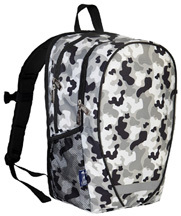 • Crackerjack Backpack Camo Gray: Colored modestly and boldly in Gray, black and white, the Camo Gray pattern stands out more than it blends in. Sized for ages 3+. Great gift idea! BUY NOW! Pack 'n Snack Backpack: Pack 'n Snack Backpack combines two products into one economic space. This Backpack features a generously-sized, food-safe insulated front pocket that can be used to stow snacks, lunch, or school supplies. 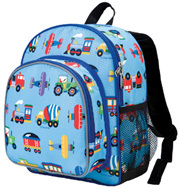 Perfect for preschool, daycare, and day trips. Insulated, easy-to-clean, food-safe front pocket. Front pocket can be used for snacks, lunch, or school supplies and mesh side pocket for water bottle. 2 zippered pockets. Reflective tape on front of bag for night-time safety. PVC, BPA and Phthalate free. Measures 12 x 10 x 4½ inches. 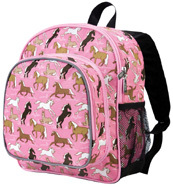 • Pack 'n Snack Backpack Horses in Pink: Horses in Pink features a group of whimsically wild horses that prance, dance, jump, and just chill; their brilliant white manes and tails absolutely shine atop the pattern's lovely, timeless pink backdrop. A bestselling Wildkin Classic. Ages 2 - 5. Great gift idea! BUY NOW! 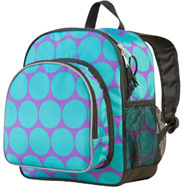 • Pack 'n Snack Backpack Big Dots Aqua: Big Dots Aqua motif features trendy-symmetrical, thrilling aqua dots on a background of gorgeous purple. Ages 2 - 5. Great gift idea! BUY NOW! 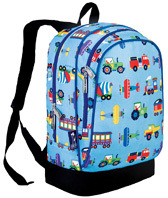 • Pack 'n Snack Backpack Trains, Planes & Trucks: The wildest, prettiest, traffic jam ever! 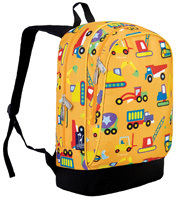 A best-selling design by Olive Kids, the Trains, Planes, & Trucks motif makes innovative use of bold primary colors. The design's extensive group of vehicles highlights wonderfully from the cool blue background. Ages 2 - 5. Great gift idea! BUY NOW! • Pack 'n Snack Backpack Heroes: A carnival of heroic lights! This lively pattern pays honor to our brave fire, police, and rescue men and women. 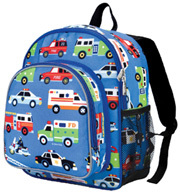 An Olive Kids design, the Heroes pattern displays absolutely distinct versions of fire, police, and emergency vehicles on a rich blue back. Ages 2 - 5. Great gift idea! BUY NOW! • Pack 'n Snack Backpack Robots: Robot Raid! These silly, zany robots invade hearts and stimulate smiles! 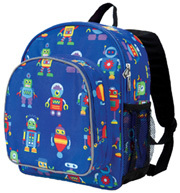 Designed by the robo-geniuses at Olive Kids, the Robots pattern showcases six colorful, welcoming robots on a dark blue background. Ages 2 - 5. Great gift idea! BUY NOW! • Pack 'n Snack Backpack Under Construction: Fashioned out of charm! Built by our friends at Olive Kids Designs, the Under Construction Pattern re-envisions the worksite in the vividly bright colors and fluid shapes of childhood. Ages 2 - 5. Great gift idea! BUY NOW! 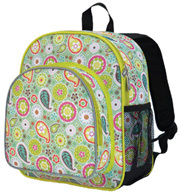 • Pack 'n Snack Backpack Spring Bloom: Feel happy when you see that everything is blooming on this lovely blossoming pattern. Featuring several different paisley and flower patterns. Ages 2 - 5. Great gift idea! BUY NOW! 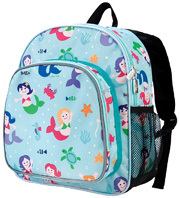 • Pack 'n Snack Backpack Mermaids: Designed by Olive Kids, the Mermaids pattern is overflowing with a charming collection of mer-girls and their fishy friends. Hot pink, yellow, and orange accents highlight from the pattern's sparkling, two-toned, under-the-sea backdrop. Ages 2 - 5. Great gift idea! BUY NOW! 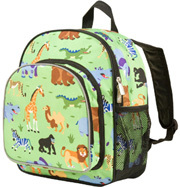 • Pack 'n Snack Backpack Wild Animals: The Wild Animals pattern by Olive Kids is like an extensive family gathering of animals from all across the globe. Penguins, Lions, Camels, Crocodiles, Hippos, Grizzlies and more have put aside their disagreements and get along and say hi! Ages 2 - 5. Great gift idea! BUY NOW! 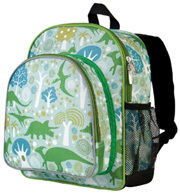 • Pack 'n Snack Backpack Dino-mite: The inspired dinosaur pattern is DINO-mite! Stegosaurus, Pterodactyl, T-Rex, Triceratops, Brachiosaurus and Hadrosaurs are all gathered here, so be careful. Set on a background of extinct plants and trees. Ages 2 - 5. Great gift idea! BUY NOW! 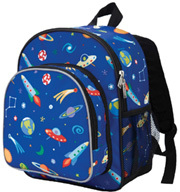 • Pack 'n Snack Backpack Out of This World: The Out of This World design's sky is a incredibly busy little universe. Designed by Olive Kids, this pattern spiritedly blends reality and fantasy with its organized versions of stars, moons, and alien technology. Ages 2 - 5. Great gift idea! BUY NOW! Comfortpak Backpack: Super Comfort Backpack is designed to securely hold anything you can carry. The comfort comes from high density padding on each side of the back which keeps most of the weight off of the spine, and adjustable, padded shoulder straps to hold the bag in place.Back made with high density padding and air mesh for extreme comfort. Two-way zip opening into main compartment includes an internal padded laptop compartment with hook-and-loop closure. Includes an adjustable sternum strap and webbing carrying handle. Mesh bottle pockets on each side for bottles. Highly-reflective band for night time safety. Measures 18 H X 12 W X 6½ D inches. 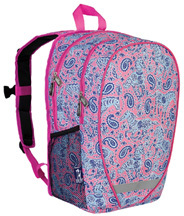 • Comfortpak Backpack Horses in Pink: Horses in Pink features a group of whimsically wild horses that prance, dance, jump, and just chill; their brilliant white manes and tails absolutely shine atop the pattern's lovely, timeless pink backdrop. A bestselling Wildkin Classic. Ages 8+. Great gift idea! BUY NOW! • Comfortpak Backpack Water Color Ponies Pink:In this imaginative horse pattern, our watercolor ponies are galloping, prancing and walking amongst paisleys and flowers. Ages 8+. Great gift idea! BUY NOW! 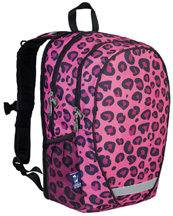 • Comfortpak Backpack Pink Leopard: The Pink Leopard pattern is hot - hot pink! We do not know how our pink leopard would fair in the jungle, but on our bags it is prominent and eye-catching. Ages 8+. Great gift idea! BUY NOW! 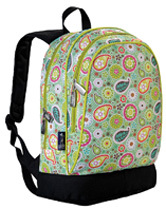 • Comfortpak Backpack Spring Bloom: Come alive when you see that everything is blooming on this lovely blossoming pattern. Displays several different paisley and flower design. Ages 8+. Great gift idea! BUY NOW! 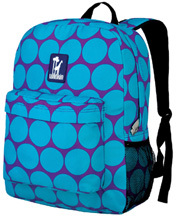 • Comfortpak Backpack Big Dots Aqua: Part of our popular Big Dot series, this Big Dot Aqua pattern displays trendy symmetrical, exhilarating aqua dots on a background of gorgeous purple. Ages 8+. Great gift idea! BUY NOW! 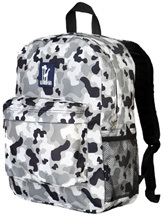 • Comfortpak Backpack Camo Gray: The Camo motif is a stylish inspired of the tested camouflage. Colored solely and boldly in black, gray, and white, the Camo pattern is very cool. Ages 8+. Great gift idea! BUY NOW! Comfortpak Backpack: Super Comfort Backpack is designed to securely hold anything you can carry. The comfort comes from high density padding on each side of the back which keeps most of the weight off of the spine, and adjustable, padded shoulder straps to hold the bag in place.Back made with high density padding and air mesh for extreme comfort. Two-way zip opening into main compartment includes an internal padded laptop compartment with hook-and-loop closure. Includes an adjustable sternum strap and webbing carrying handle. Mesh bottle pockets on each side for bottles. Highly-reflective band for night time safety. Measures 18in.x 12in.x 6½ in. 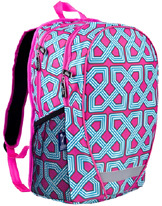 • Comfortpak Backpack Twizzler: Get lost in a maze of hot pink and turquoise! Twizzler print is both stylish and full of fun! Ages 8+. Great gift idea! BUY NOW! 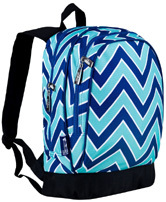 • Comfortpak Backpack Zig Zag: Add some vigor to your style with the Zigzag print! Two thick colorful bands plus a thin white one zig and zag to generate a truly contemporary take on the classic chevron print. Ages 8+. Great gift idea! BUY NOW! 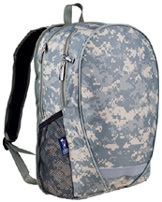 • Comfortpak Backpack Digital Camo: This memorable Army Camo pattern is definite to blend in and at the same time, stand out! Ages 8+. Great gift idea! BUY NOW! 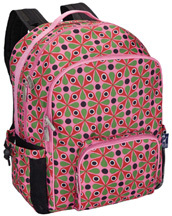 • Comfortpak Backpack Pinwheel: This Pinwheel pattern is a cheerful pattern in bright colors and geometric shapes. This print will be sure to twirl you away to a festival of color! Ages 8+. Great gift idea! BUY NOW! 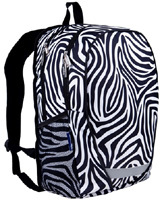 • Comfortpak Backpack Zebra: This Zebra print may be a camouflage in the wild but will stand out in a crowd! The distinct animal print is a swirl of black with white stripes, or is it white with black stripes. Either way, we know you'll love it! Ages 8+. Great gift idea! BUY NOW!